For the people of Fukushima, Japan, it’s easy to feel forgotten and neglected; angry, stressed and wary. More than two years after the earthquake and tsunami – and the resulting meltdown of the Fukushima I Nuclear Power Plant on March 11, 2011 – they struggle with the invisible disaster that surrounds them with every breath they take. BGEA’s Chad Hammond and his team have worked extensively in the area and have seen the stress firsthand. The tragedy has brought extensive suffering to the people of Fukushima. There is distrust of the government and of Tokyo Power. Families are living in temporary houses because their homes are cordoned off in restricted areas with high levels of radiation. People have lost their incomes in the wake of the disaster, and marriages and families are dissolving as the mothers move the children into other parts of Japan, leaving the fathers behind. As all of this has taken place, they’ve watched as outside help has gone around them into other areas. “The thing is, in Fukushima you don’t see the destruction. It’s an invisible disaster. It’s radiation, and you can’t see radiation,” Hammond explained. “In Tohoku you could see the devastation of the tsunami, where boats were in the fields, cars were in trees, and you could tell from the scenery that there’d been a massive disaster in Tohoku, so everybody was going to Tohoku. The BGEA team began researching the needs of the area and implementing efforts to help alleviate some of the stress, including helping with the distribution of water and taking children out of the radiation area for a few days at a time. 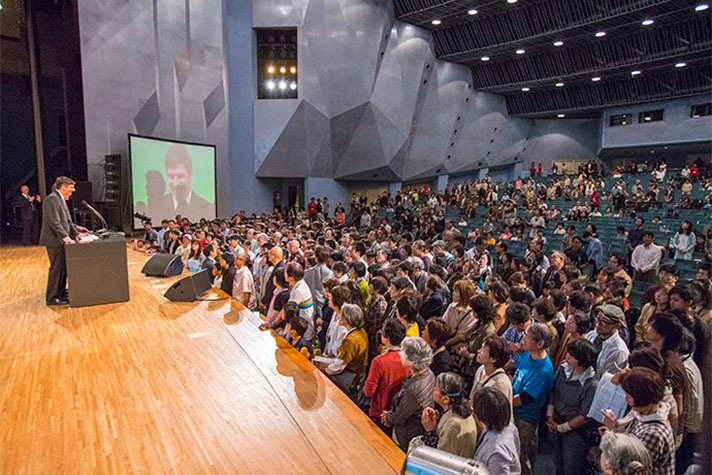 Those efforts eventually opened the door for what will happen this weekend, as the Fukushima Celebration of Hope with Will Graham comes to fruition. With high-energy music and inspirational messages from evangelist Will Graham, the two-day event will offer a couple hours of escape from the stresses of life, but – more importantly – an opportunity to escape the hopelessness for eternity. Though churches in Japan tend to be small, more than half of the 120 churches in the prefecture of Fukushima are cooperating in the joint evangelistic effort. And that unity is bringing a high level of excitement in these dark days. -Pray for the people of Fukushima, as there is a deep level of emotional, spiritual and physical pain that has resulted from the March 2011 tragedy. Pray that many will come to the event and clearly hear and understand the Gospel. -Pray for all of the musical artists who will share the love and hope of Christ through song at the Celebration, including Lena Maria of Sweden, Alfie Silas of Los Angeles, and Mark Christian of Charlotte, N.C.
-Pray for Will Graham as he shares the Gospel of Jesus Christ to those who attend the services. “This is my first time to preach evangelistically in Japan in a Crusade format. It’s a very difficult place. A tough place to understand culturally,” said Graham. Pray also for his interpreter, that he would clearly translate Will’s words in an easily understandable way for the people of Fukushima.